Having been curious about Epicurious for quite some months, I finally managed to make a trip there for brunch with my parents. I’ve read quite a number of good reviews, including a TimeOut article rating Epicurious as having the best brunch menu in Singapore! With high hopes and hungry parents in tow, we arrived at about 11am. The staff were flying about all over the place and we only managed to get their attention and a table a few minutes later. We were lucky, it seems we got the last table before a queue started forming. By the time we wanted to order, there was a queue about 5 deep (that’s 5 tables worth, not 5 people). The staff were flat out and no matter how much we waved, they were oblivious to it. And one staff was still trying to get more people seated. If you ask me, they should have the sense to serve the existing customers, then we can free up the tables sooner for those still in line! Anyway, we finally managed to place our orders. I was already feeling quite pissed off by the service by then. Who on earth was the one who said this was a good place to have Brunch? Things improved tremendously when the food arrived after a 20 minute wait. We were okay with the 20 minute wait because my parents had ordered the Baked Eggs with Toast Soldiers and it was already stated in the menu that it would take 20 minutes. I had ordered the Customised Big Breakfast and it arrived together with the Soldiers. The Baked Eggs with Toast Soldiers (2 eggs with tomato and cream and choice of ham or mushroom or shrimp, covered with cheese and baked until gooey) was as good as the menu’s description. If not better. The cheese was absolutely baked to gooey perfection. It was like digging into a steaming treasure bowl, full of melted cheese, mushrooms, bread and eggs. The cheesy and eggy combination had me momentarily distracted from my own breakfast as I tried to attack some of my parents’ dish before it disappeared. This is really comfort food at it’s best, and only $12!!!!! As for my own “Customised Big Breakfast”, I was superbly pleased with it. It is 2 eggs scrambled or fried, served with buttered toast $6, and you choose sides such as tomato, chopped spinach, baked beans, cheddar, ham, chorizo, mushrooms, smoked salmon, bacon and sausage. 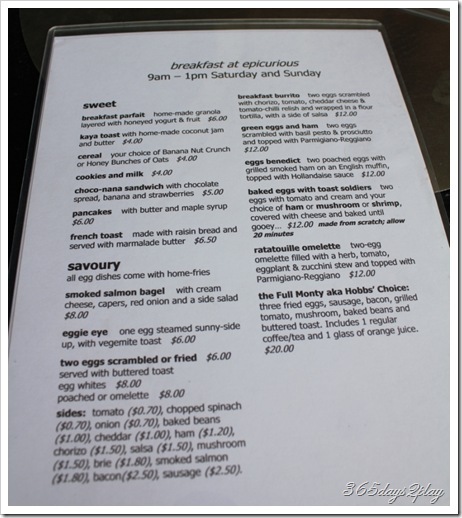 I could have taken the Full Monty for $20, which gets you 3 eggs plus fixed sides, a coffee AND orange juice, but since I didn’t want the orange juice, the customised Big Breakfast suited me just fine and cost just over $12 for the items I chose. The whole plate was laden with all the goodies I had chosen. Epicurious is really generous with the portions. When I chose sausages, I thought there would only be about 2, and look at the size of the cheese slice. I only wish for maybe a little bit more bread to mop up the goodness of the runny eggs. The eggs were fried just the way I wanted them. The whites were still crispy at the edges, but tender and fluffy all around, with a runny egg yolk centre. Delicious like anything!! 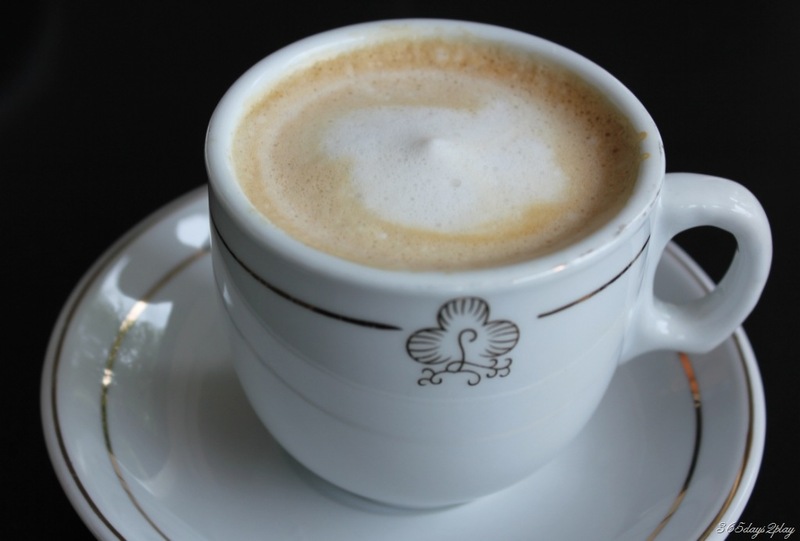 So what started out like a really bad morning was saved by the really good breakfast served. It says a lot when my parents proclaim that they will actually return. After all, they prefer beehoon soup, teochew porridge or nasi lemak for breakfast than the western fare we just had. So I conclude with these tips. Go to Epicurious for very good Brunch food at very affordable prices. But don’t expect friendly service. I briefly googled and saw a lot of similar negative comments on the forums. Unfortunately I doubt that Epicurious will be upping its service, not for the weekends anyway. They aren’t crowded at all on the weekdays so it doesn’t make sense for them to hire more staff. 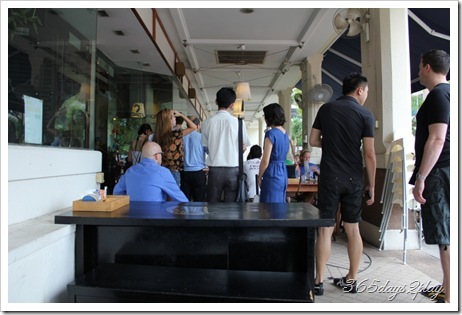 And they will always have enough customers on the weekend thanks to the numerous expats living around Robertson Quay. My very own customised big breakfast. 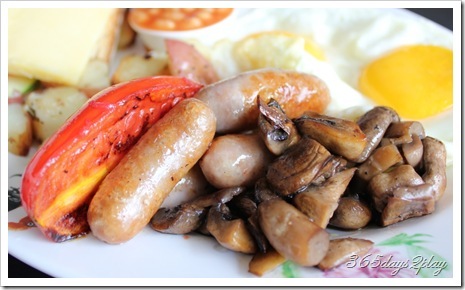 The eggs and buttered toast are fixed, but be sure to order the delicious mushrooms and sausages at the very least! 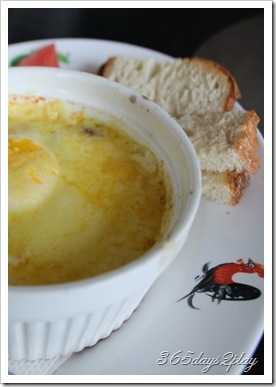 Baked Eggs with Toast Soldiers, and choose from Mushrooms, Ham or Shrimp. 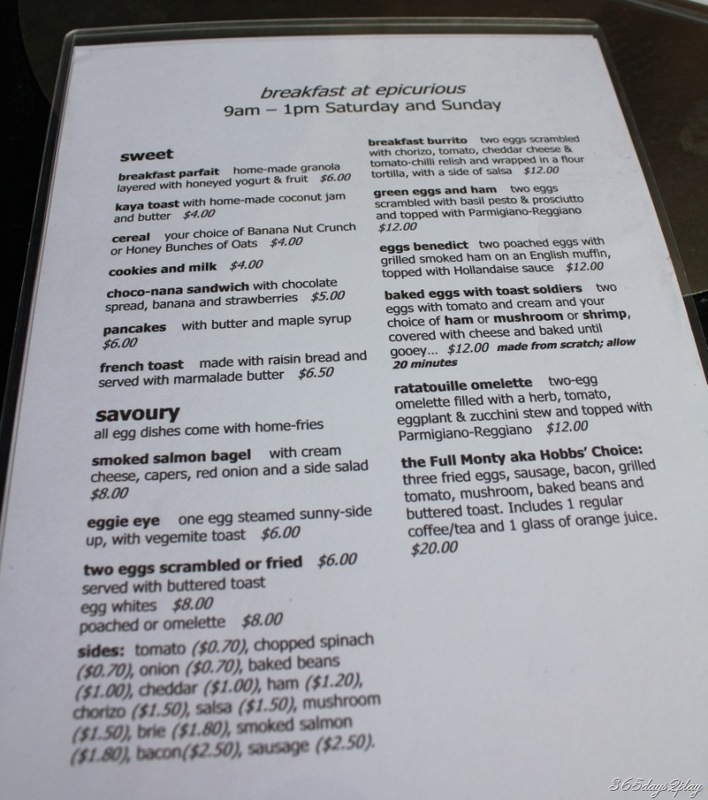 Epicurious weekend breakfast menu, served 9am – 1 am Those green eggs and ham sound delicious, and I saw a lot of people ordering eggs benedict too.